I am very excited about 2016, mostly because I have never before felt so ready and in control about a year. I am willing to accept that not everything will go as I wish it would, but I have a clear conscience knowing that whatever will come I will be ready to deal with it. How about you? Are you excited about having a whole extra day to make all your dreams come true this year?! If you’re looking for ways to make that happen, keep reading the blog, because I’ve planned some really useful content for the months ahead. 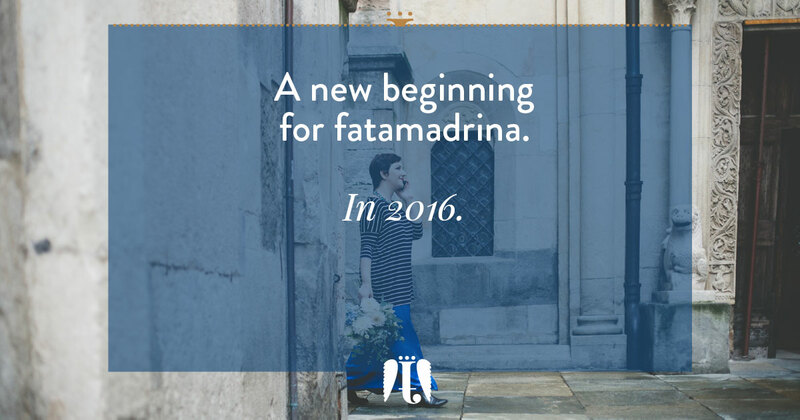 In fact, the official blog scheduling is set to begin on Friday, but I thought it would nice to stop by on this first Monday of 2016 to explain a bit more of what will happen at fatamadrina and on the blog in the following months. First and foremost, please beware that if you look online you will see that I have two blogs, one is dedicated to Italian readers only because it deals with topics that are specific to that audience, while this one is dedicated to all those couples who are planning a destination wedding in Italy. In here, you will find useful content, tips, guides and inspiration for you wedding, whether you decide to hire me or you’re working on your own or with a colleague. The underlining theme will always stay true to my mission, which is to help free-spirited couples like yourselves plan a wedding that’s exclusively and uniquely yours, free from impositions and social pressure. on March 18 you will find ideas of Italian destinations that are perfect for a Spring wedding. it’s now come the time to finally deploy all of the branding analysis in a logo and a brand image that tell the story of my business more effectively. I have been working with a team of professionals since October 2015 and the new logo and website will launch in the Spring of 2016. Perfectionism is not to blame for the timeframe, mind you, it’s just that when you work with really great people schedules tend to clash. So there you have it, the last you will hear about boring me-me. From now on it will be all about you, and how I can help you have the wedding in Italy you have always wanted but never knew you could have. If you will see things changing or the website and blog going offline for a few days, do not be alarmed, you know I’m just priming for an amazing season! The surefire way of keeping in touch, if you wish to do so, will always be via Instagram and my email. In the meantime, have a fantastic start of the New Year!